Shiprock is named after the nearby volcanic rock formation known in Navajo as Tse Bit'a'I, or "winged rock." It lies at the junction of U.S. Highways 64 and 491 and is known locally for its rodeos, fairs, and marathons. It is also renowned for its Navajo traditional artisanal works, such as rugs and jewelry, which can be bought from the creators themselves rather than from trading post owners. 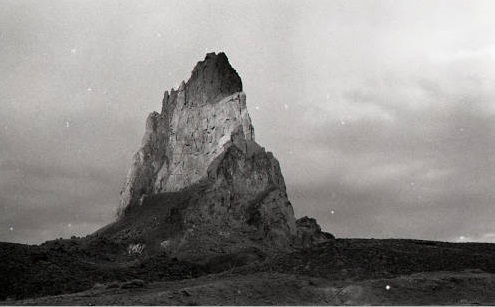 "Shiprock Peak, New Mexico, on the Navajo Nation," photograph, Lee Marmon Collection (2000-017-B18-F27-1). Center for Southwest Research, University Libraries, University of New Mexico.